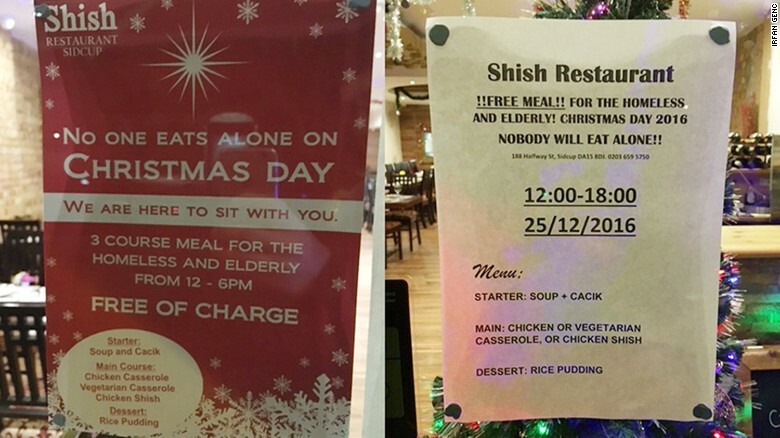 Muslim restaurant to feed homeless free on Christmas Day! London (CNN) A Muslim-owned Turkish restaurant is offering a free three-course meal to the homeless and elderly on December 25, because no one should eat alone on Christmas Day. The gesture stemmed from a chance encounter with a woman who needed help closing her window. The restaurant, Shish, is located on the outskirts of London. Early last month, an elderly woman who lived in the neighborhood came in to the restaurant and asked if anyone could help pull down a window she was having difficulty reaching. The staff didn’t hesitate. And when the woman returned the next day to thank them, she told them how she’d be alone for Christmas. 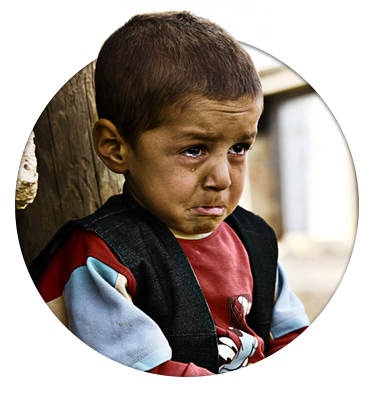 Her situation reminded owner Serdar Kigili of his mother in Turkey, whom he hadn’t seen in five years. The management team then came up with the plan. The post has now been shared more than 1,000 times on the restaurant’s Facebook page. It inspired more than 25 residents to volunteer their time helping out that day. And a group of taxi drivers in the area have also said they will shuttle the elderly and homeless to and from the restaurant for free. “It’s not about religion, language or culture. It’s about community,” one of the managers, Irfan Can Genc, told CNN. Please share this around and get the news forward to anyone that is in need/elderly/ homeless. The approximately 66-seat space will be open all day, serving starters of soup and cacik, a yoghurt-based dip and mains of chicken, vegetarian casserole or chicken shish. Traditional rice pudding will be offered as dessert. ​In 1892 at Stanford University, an 18-year-old student was struggling to pay his fees. He was an orphan, and not knowing where to turn for money, he came up with a bright idea. He and a friend decided to host a musical concert on campus to raise money for their education. The big day arrived. But unfortunately, they had not managed to sell enough tickets. The total collection was only $1600. Disappointed, they went to Paderewski and explained their plight. They gave him the entire $1600, plus a cheque for the balance $400. They promised to honour the cheque at the soonest possible. Why should he help two people he did not even know? We all come across situations like these in our lives. The truly great people think, “If I don’t help them, what will happen to them?” They don’t do it expecting something in return. They do it because they feel it’s the right thing to do. He heard there was a man called Herbert Hoover — who later went on to become the US President. Hoover agreed to help and quickly shipped tons of food grains to feed the starving Polish people. A calamity was averted. Paderewski was relieved. The world is a wonderful place. What goes around comes around. Please help others to the best of your ability. In the long run you may be helping yourself. God never forgets anyone who sows a good seed in other people, never. Living for others is the rule of nature. And therein lies the secret of living.